The Gama Sonic Colonial Solar Lamp with 3 inch Fitter showcases an attractive blend of a traditional and Mission-Style type design. The unique and decorative geometrical floral pattern on the lamp head's outer rim is a standout decor piece and does not require electrical wiring during the installation process, just direct sunshine. Designed to fit an existing 3" Fitter Post. • New Solar Technology: This technology takes the conventional idea of a light bulb and incorporates it into solar-powered outdoor lamps fixtures. The bulb not only gives your yard ample lighting but also gives the lantern a traditional look since it resembles a standard electrical light bulb. • Warm White Light: At dusk, the outdoor solar light will automatically turn on and shine a warm-white light through the rain glass panes at a brightness of 120 lumens on a full solar charge. • 3 Inch Fitter: Our Colonial Solar Lamp comes with a 3-inch fitter attachment that will fit on any existing 3-inch outside diameter lamp post (Post not included). • Fully Solar Powered: Just set our Colonial Solar Lamp at your desired location, and let the sun do the rest. The solar lights internal Lithium-Ion battery packs charge when sunlight hits the integrated solar panels. • Built to Last: The Colonial Solar Post Light includes (2) Lithium-ion battery packs which are good for about 1,000 charges. Once the batteries exceed their life � all you need to do is simply replace the battery pack and you are good to go for the next 3 years. Additionally, the GS Solar LED Light Bulb has a 10-year lifespan (50,000 hours), lasting the life of the unit which is 10 years. 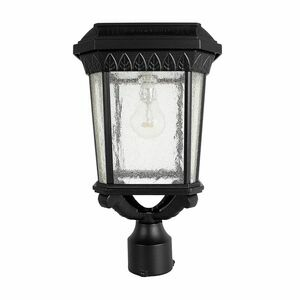 The outdoor Imperial 6.5 Foot Black Decorative Post with 3-Inch Fitter is the perfect starting point for converting outdated electric or gas-powered outdoor lighting with energy-saving solar powered lighting. This sturdy outdoor lamp post features a glossy black finish and is compatible with all solar lights with the 3-inch fitter mount.